A native of Haarlem, he appears to have studied under his father Isaak van Ruysdael, a landscape painter, though other authorities place him as the pupil of Berghem and of Allart van Everdingen. He was the nephew of Salomon van Ruysdael, a landscape artist of some note, and studied under him as well. The earliest date that appears on his paintings and etchings is 1645. Three years later he was admitted as a member of the guild of St Luke in Haarlem; in 1659 he obtained the freedom of the city of Amsterdam, and in 1668 his name appears there as a witness to the marriage of Meindert Hobbema. During his lifetime, his works were little appreciated, and he seems to have suffered from poverty. 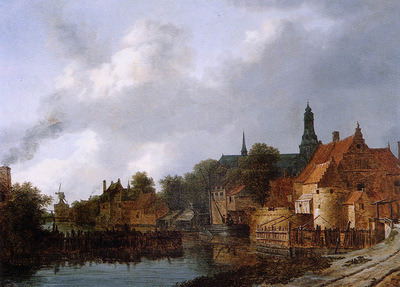 In 1681 the sect of the Mennonites, with whom he was connected, petitioned the council of Haarlem for his admission into the almshouse of the town, and there the artist died on the 14th of March 1682.